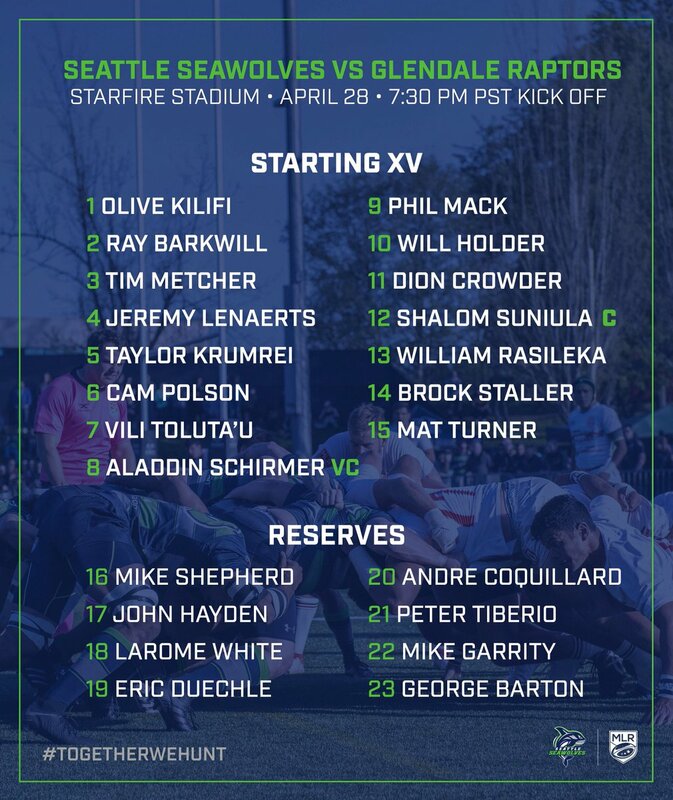 The Seattle Seawolves hosted the Glendale Raptors at Starfire Stadium in Tukwila, Washington. The wet, Seattle weather made this an interesting match. Points were at a premium today, as both teams scored less than 20 points. The Raptors had some balls bounce their way and survived a late effort from the Seawolves to earn the victory. The Seawolves showed that they will be one of the top teams in the competition this season. Maximo de Achaval was the first person in the scorebook, although not for the best reason. de Achaval was given a yellow card for dangerous play. He put a kick up and went after it but got caught under Phil Mack who went up for the ball. Because of the contact in the air, the referee showed the yellow card. The Raptors were able to put some points on the board down a man. After Seattle was given a penalty for not rolling away, Will Magie slotted the penalty kick through the uprights from just outside the 22 meter line. Magie added a second penalty kick from about 30 meters out after Seattle was called for offsides. Glendale had an opportunity to extend their lead with a try, but got caught lollygagging and Seattle forced a Raptors turnover when they didn't release the ball after being tackled. Zach Fenoglio had a beautiful try for the Raptors near the end of the first half. The rain gave the Raptors a little help. Fenoglio put a grubber kick through about 22 meters out. Mat Turner came over to cover for the Seawolves but the ball slipped through his hands, where Fenoglio was waiting to recover and slide five meters in for the try. Will Magie converted to put the Raptors up 11-0. Seattle was able to get on the scoreboard right before halftime. The Raptors were called for offsides just inside the Raptors 10 meter line and Brock Staller put the penalty kick through the uprights. Seattle's scrum is why they dominated the San Diego Legion last week. The Raptors were able to handle the Seattle scrum this week. They worked the ball back quickly, earned scrum penalties, and were able to push the Seawolves scrum back occasionally. Though they did occasionally get overpowered. The Raptors put the first points on the board in the second half. Harley Davidson put his name in the scorebook for Glendale with a try. The Raptors had a couple line breaks leading up to it. Shaun Davies gained a number of meters up the middle of the ruck and Peter Dahl had a line break of his own. Dahl also had the assist on the try. The Seawolves got their first try of the match nearly halfway through the second half. After overpowering the Raptors scrum and earning a scrum penalty, Phil Mack quick tapped and got stopped short of the line. Vili Toluta'u was their for the clean up and dotted down on the try line for the try. Staller converted the try to bring the Seawolves within a converted try of the lead. Seattle was called for playing the ball in front of the knock on and Will Magie took the opportunity to attempt a penalty kick. That attempt stayed wide right. Magie was able to make up for that missed kick. The Raptors earned a scrum penalty from the Seawolves as the Seawolves were called for wheeling the scrum and Magie slotted the penalty kick right through uprights. Seattle earned a bonus point in the loss with a last second try. Seattle elected to scrum five meters out from the line. Phil Mack passed out of the scrum to George Barton who was able to spin away from a Raptors tackle and dot down for the try. This was a great match. A fantastic representation of hard nosed rugby. If you want to introduce somebody to rugby, this might be the match to do it with. Seattle's scrum was their strong point, but the Raptors held their own even down three starters. The Raptors proved why they were the preseason favorites to win and the Seawolves continue to prove their doubters wrong. This match could've gone either way. Seattle was one bounce away from winning this game. Both teams will get back in the film room and fix the small mistakes. There were no big discipline issues in this match, just numerous handling errors. But that can't be attributed to the weather. Glendale is back next week when they visit Zions Bank Stadium and the Utah Warriors. The Seawolves have a bye next week, but they'll be back in two weeks when the travel to New Orleans to take on the NOLA Gold squad.